Hamilton Beach is one of my favorite brands of kitchen equipment, and I've used their coffee makers for years. 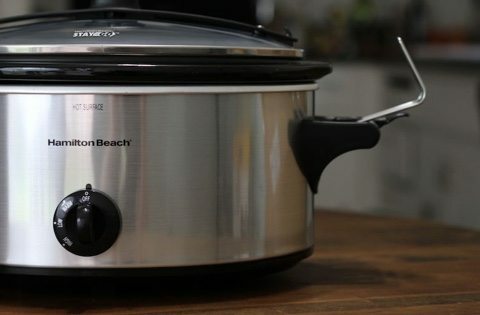 The products they make are a great combination of functionality and value, and this slow cooker lived up to that reputation. 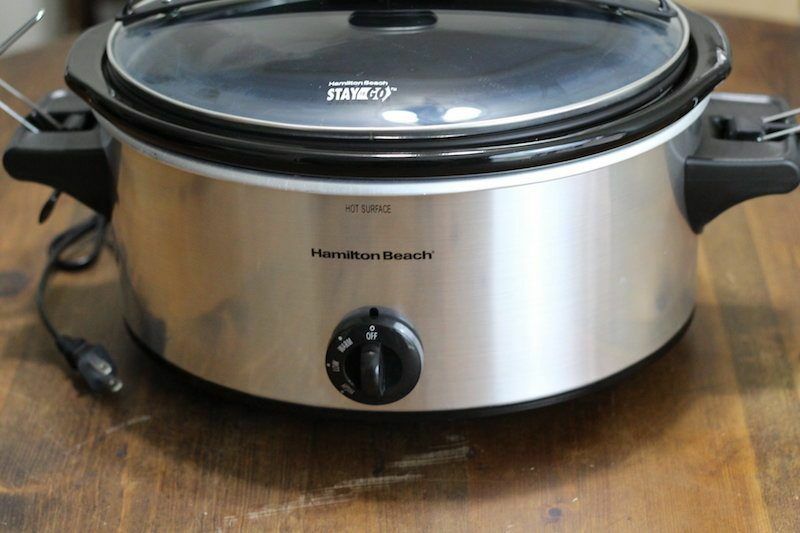 The standard six quart capacity plus standard features makes the Hamilton Beach 33262A Stay-Or-Go Slow Cooker a great buy for anyone on a budget. Oh yeah, I didn't mention yet that this model is available for a great price, which means it has competitive pricing even against 4-quart slow cookers. This is the basic six quart model of the Stay-Or-Go lineup from Hamilton Beach, so there aren't many fancy features to report. 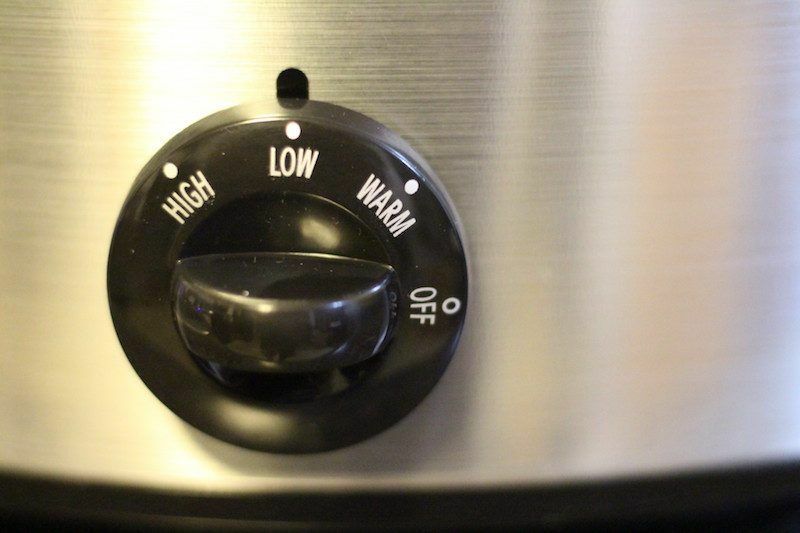 You've got a round spin-dial to set the temperature to WARM, LOW, or HIGH. There's no digital timer or automatic warming feature. The cooking vessel is made of ceramic stoneware covered with a smooth glaze which prevents anything in from the porous clay seeping into your meal, or vice versa. I was not a fan of the lid design though. The black plastic strips on either side seemed unnecessary and unattractive. But I guess if you're going for budget and functionality, then design doesn't really matter. This particular model does come in silver, white, and copper (unique!). The lid has a rubber seal which is necessary to completely seal the vessel while traveling. The main appeal of purchasing a Stay-Or-Go model is the lockdown hooks features on each side of the lid which allows you to travel with food spill-free! 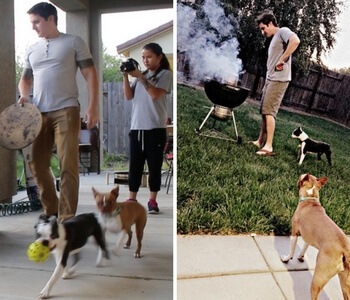 Many folks have submitted photos on other review websites to prove that it works. Unfortunately, I did no do the same, but I'll take their word for it. But as for other extra features, this model is pretty basic, hence the budget price. One thing I wish they would have added however to the Hamilton Beach model 33262, 33263, and 33264 (silver, white, copper), is at least an “on” light to signal when the cooker is actually working. It's safe to assume that everything is working as it should be, but still, it would be nice to know for sure. I guess fewer electronics leave fewer chances to break down the road, so you may see this as an advantage! With the 6-quart Hamilton Beach Stay-Or-Go I cooked a very delicious beer-soaked brown sugar & soy sauce pork chop recipe. 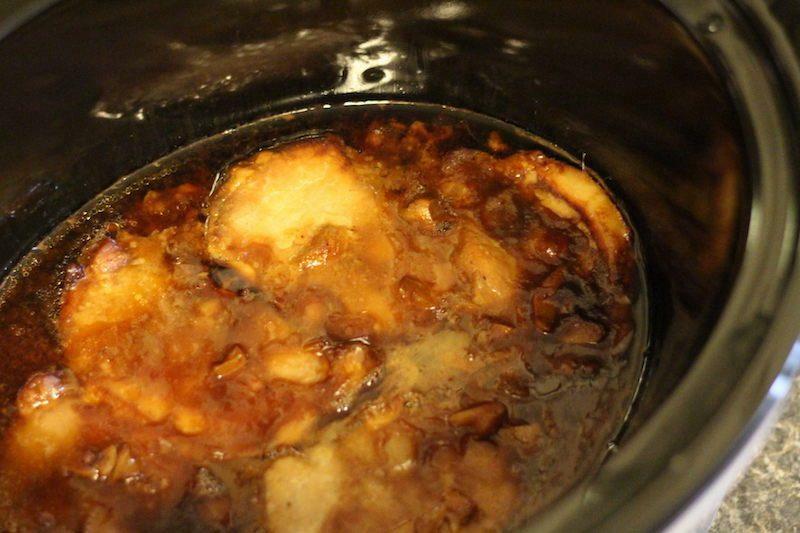 It's always fun working with beer, so I tweak some of my favorite, self-made slow cooker recipes to include beer in the recipe. In this case, I used a german Dunkel to sweeten up and darken the sauce. It went perfect with a baked sweet potato which I prefer compared to the starchiness of white potatoes. Cooking with the Stay Or Go was pretty standard. Everything in the recipe went off without a hitch. This was a pretty simple recipe to cook since it was basically just slow cooking some pork chops in sauce. I guess that's how most slow cooker recipes go anyway. This is the fun part! So is the 6-quart Stay Or Go for you? 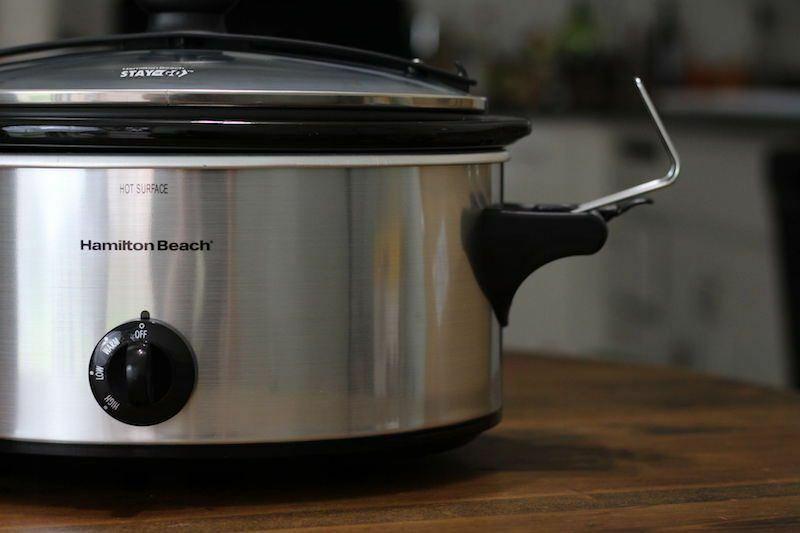 First off, if you think that six quarts is too small but you like the brand and concept behind this slow cooker, then you should check out my full review of the Hamilton Beach 4-quart Stay-Or-Go. It's basically the same cooker, but smaller, and will all the same functions. It would go better in a smaller kitchen. But if you are sure you want to stay with the six quart version, then you should review the comparison chart below. It compares my favorite six quart slow cookers in the same price range as the Hamilton Beach. You can see that HB currently ranks #2 on the list. Crock-Pot has way more reviews, and also a higher overall average star rating on Amazon. 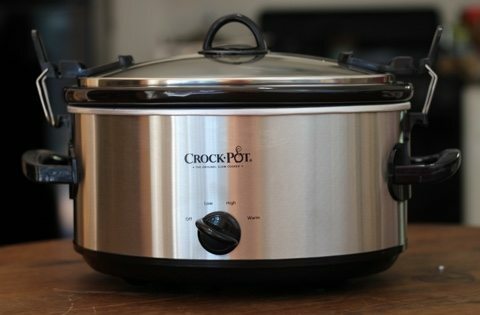 It's clearly the more trusted brand in the slow cooker world, and the brand reputation seems to hold up from real buyers that have bought and used the product. The handles for the Crock-Pot Cook ‘N Carry SCCPVL600-S are simply better designed and more sturdy. I mean, if you're really going to be lugging a hot stew around, it's nice to have strong handles with holes/loops in them to get a good finger grip. I'm thinking mainly of safety here! You also may want to consider looking at the premium 6-quart slow cookers. In the six quart range, these devices offer some really cool features like precise programming for different amounts of time or food, or different types of food. Who Is The Hamilton Beach 6-Quart Stay Or Go Best For? 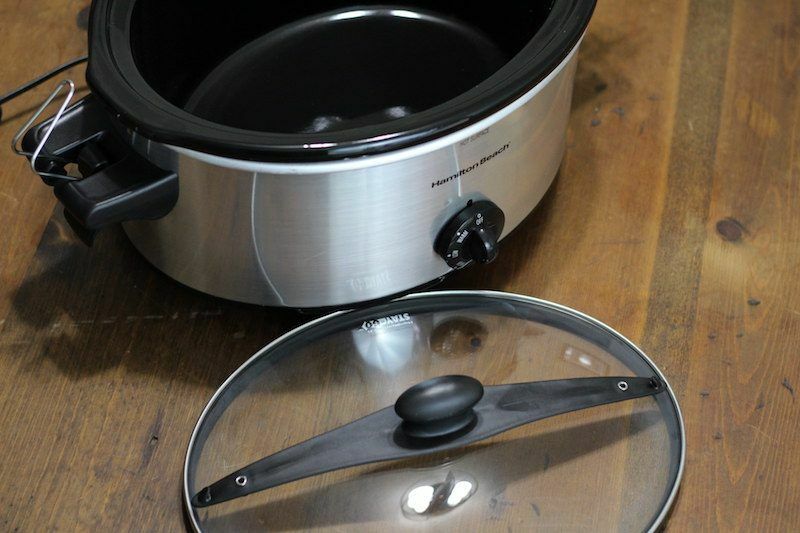 This slow cooker is best for someone that needs a six quart capacity cooker, and prefers the design of this particular model, or just prefers the Hamilton Beach brand. If you are undecided, or don't care, I would recommend going with the Cook ‘N Carry, but if you really want a Hamilton Beach product, this will be just as good, and fulfill most of your slow cooking needs. Models 33262-4 are also good because they are very cheap, being listed on Amazon for for reasonable prices depending on the individual seller. 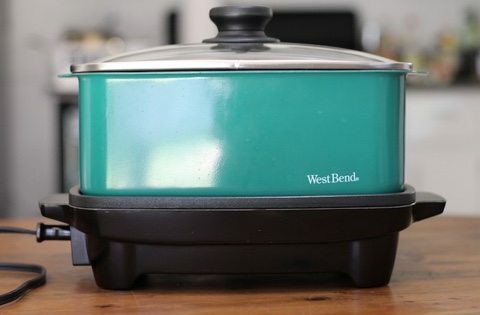 If you're just getting started with the art of slow cooking, or don't want to spend a lot of money on a device you won't use very often, then it makes sense to get a more budget model like this one. This is a very inexpensive six quart slow cooker that will fulfill your basic cooking needs, and is probably appropriate for most kitchens, regardless of cooking skill or budget. But if you want more functionality, you should look into the mid-range or premium models. 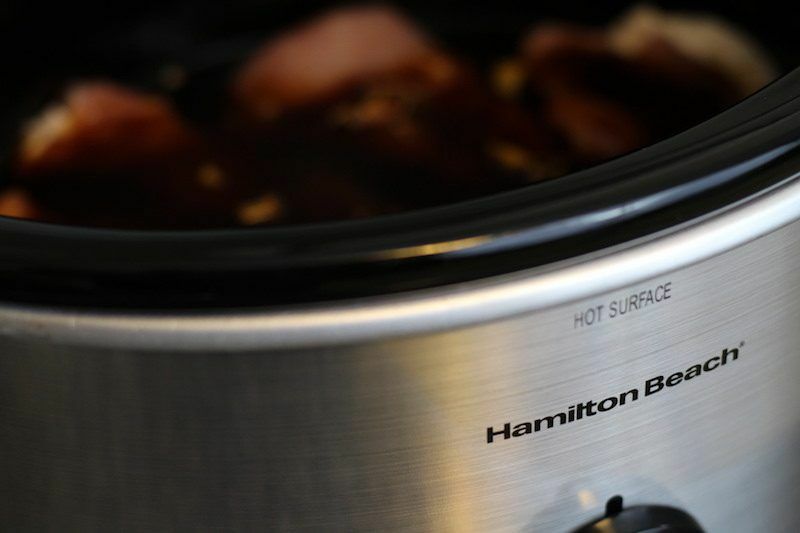 Here's a list of my favorite Hamilton Beach brand slow cookers.